The Thermo Forma Series II Water Jacket CO2 incubator comes equipped with a unique triple wall construction providing great protection against temperature loss in case of unexpected power outage, while ensuring quick recovery and maximum thermal stability. This is a key factor for laboratories working with critical cell cultures. The Forma Series II 3110 features total contamination control which minimizes the risk of airborne contaminants introduced to the incubator upon door opening with a valid table in-chamber HEPA air filtration system, maintaining your cultures in Class 100 air quality conditions. This water jacketed incubator is double stacked for more incubation power in the same foot print. Included with the Thermo Scientific Series II Water Jacket CO2 incubator is a patented in-chamber HEPA air filtration system which continuously filters the entire chamber volume every 60 seconds, minimizing particulates to class 100 cleanroom levels while preserving your aseptic culture environment. The Thermo Scientific Forma 3110 incubator come with polished stainless-steel interior and built for easy cleaning, while meeting the needs of any specific laboratory. Additional features include CFC-free foam insulated outer door, durable triple-wall cabinet construction, and magnetic outer door gasket. 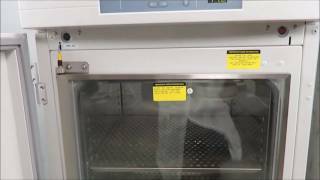 These Thermo Forma 3110 Series II Water Jacket CO2 incubators are in excellent condition and backed with our standard warranty. Should you have any questions, please don't hesitate to contact us.